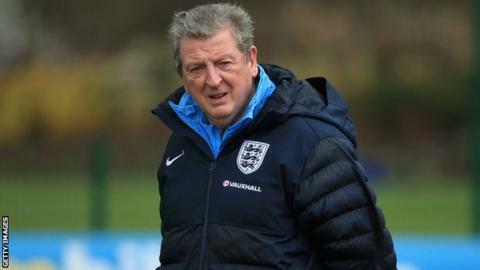 England boss Roy Hodgson says he has known for some time who he will pick in his squad for this summer's World Cup in Brazil. Hodgson, 66, insists that, barring injury, his mind is made up and he will not be swayed by recent peaks and troughs in form. Hodgson, who names his 23-man squad on Monday, told the Football Association's website: "I've known for a while." He has ruled out anyone making a late surge into the squad. He said it was "frivolous" to think he would select a player "that had not played any point" in the last two years. The former Blackburn, Fulham, Liverpool and West Brom boss said any youngsters included in the squad will be there on merit. "If there are young players in the squad, it will be because they can do a job now," he said. Hodgson said he had a few selection "headaches" after England's 1-0 friendly win over Denmark in March and also indicated he would be prepared to omit big names. England begin their World Cup campaign against Italy in Manaus on 14 June, followed by Group D matches against Uruguay and Costa Rica.